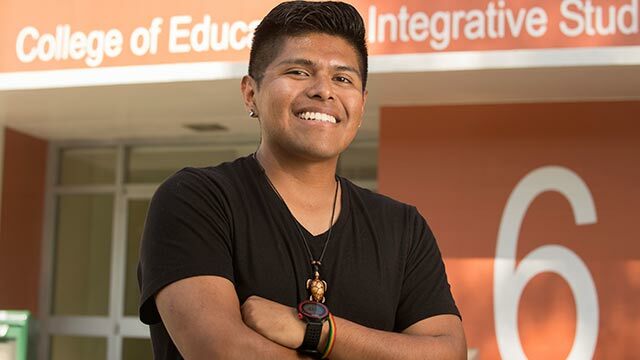 Edmundo Perez, an early childhood education student, was one of 32 college juniors selected to participate in a selective program that prepares men of color for doctoral studies or jobs in research. Edmundo Perez was one of 32 college juniors picked to attend a highly selective summer program that prepares undergraduate men of color for doctoral studies and other research related careers in education, public policy, criminal justice and workforce development. To be considered for USC’s Grad Prep Academy, students were asked to submit information regarding their personal and academic background, two references and a 750-word essay. Participants attended faculty research presentations, learned how to apply to graduate school and were paired up with a mentor. Perez’s current research project involves creating a learning application for people with disabilities. “My learning application will help people with Autism Spectrum Disorder (ASD). People with ASD struggle with repetitive behaviors and communicating effectively. My application would help improve these skills,” he said. His goal is to become an occupational therapist and help disabled patients develop life skills. Perez also serves as a research assistant in the Department of Early Childhood Studies in the College of Education and Integrative Studies. For more information about CEIS, contact Ashley Jones at 909-869-5370.